Through the weekend, temperatures across much of the Midwest and Northeast are forecast to trend near to slightly cooler than normal. This is in stark contrast to the heat wave that is expected for the South Central US. Today and through much of the weekend, temperatures well above normal as well as high humidity are forecast for the region which could send heat indices soaring well over 100F, even topping 110F for some. Although Heat Advisories and more localized Excessive Heat Warnings are already in effect through Friday evening for areas of Texas, Oklahoma, Arkansas, and Louisiana, it is likely these will be extended through the weekend as the heat and humidity sticks around. As we get into next week, though, these above normal temperatures will be largely replaced by near to slightly cooler than normal temperatures for much of the week. In fact, much of next week across the Central US is expected to trend cooler to much cooler than normal while the West trends well above normal and the East experiences a variety of trends during the week. Temperatures could fall as much as 10-15F below normal for several states on at least one day next week, but widespread trends of 5-10F below normal are expected. The East Coast will begin next week on a slightly warmer note but the cooler trends make their way into the region later in the week. Although temperature trends may vary throughout the week, the East is expected to have a rather wet week on its hands as tropical moisture gets ushered into the region. Rain will spread across the Midwest at the end of this week, and make its way into parts of the Mid-Atlantic by the start of the weekend. By Sunday, and lasting most of the week, rain will spread across the East Coast bringing day after day with rainfall. Widespread areas of 5-10” of total weekly rainfall are expected. July to date for much of the East has been drier than normal with areas of abnormal dryness or moderate drought now appearing in New England, the Mid-Atlantic, and portions of the Carolinas. The rain next week should help to improve or possibly even eliminate these areas of dryness. Iowa: 9th driest in 27+ years, slightly wetter than last year. Missouri: 4th driest in 27+ years, drier than last year. 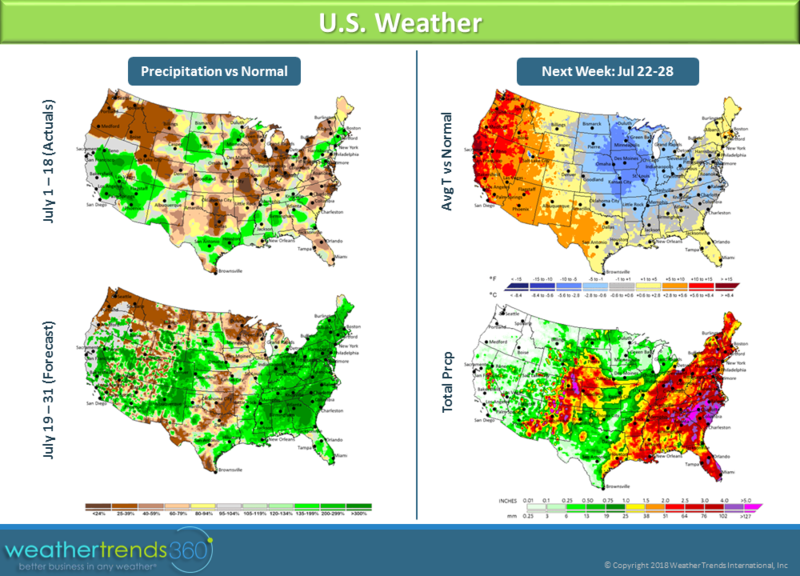 Kansas: 14th driest in 27+ years, slightly wetter than last year. Nebraska: 12th wettest in 27+ years, wetter than last year. South Dakota: 5th wettest in in 27+ years, much wetter than last year. North Dakota: 12th wettest in 27+ years, much wetter than last year. Minnesota: 12th wettest in 27+ years, much wetter than last year.